Cashews contain Selenium which can help to neutralise and reduce oxidative stress to our body and brain. Begin by making the avocado purée. Halve the avocados, remove the stone and scoop the flesh into a small blender container. Add the lemon juice and season well with salt. Blend until smooth then set aside. Heat 1 tsp of the olive oil in a large non-stick pan. Season the mackerel each side with salt. When the pan is hot, gently place as many mackerel fillets as will fit comfortably in the pan, skin-side down. Do not overcrowd the pan as the fish will stew instead of turning crisp. Cook until golden brown on the skin side, for approximately 3–4 minutes, then very gently flip over and cook for another 2 minutes. Gently remove from the pan and keep warm whilst you repeat with the other fillets and the remaining oil. Whilst the fish is cooking, bring a large pan of salted water to the boil. Add the broccoli and cook for 2 minutes until just al dente. Strain and place in a large bowl. Mix the tahini, olive oil and cider vinegar together with a tablespoon of water. Pour over the broccoli and mix with the toasted cashew nuts. 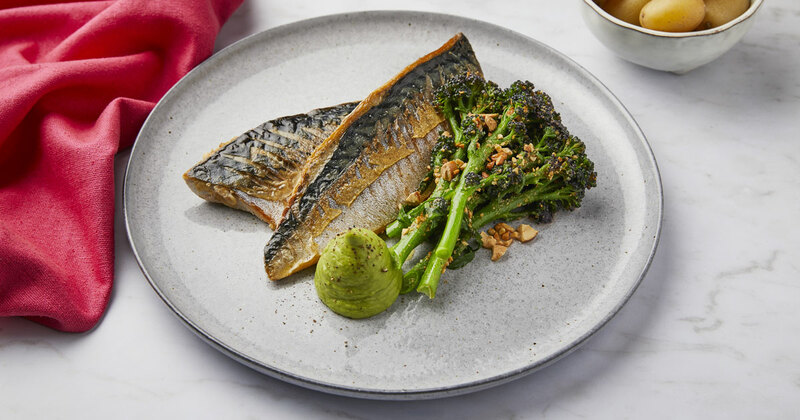 Serve the mackerel fillets with the broccoli salad and avocado purée. Grind some black pepper over the dish and, for a more substantial meal, serve with steamed new potatoes on the side.